Enrich your skin with Filorga Nutri-Filler Cream, a replenishing moisturiser that deeply nourishes skin and helps to redefine the facial contours. 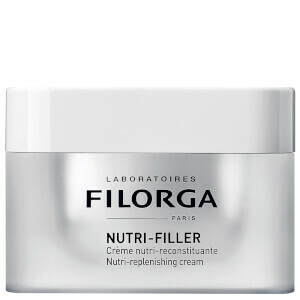 Delivering a cocoon of intense nourishment, the non-greasy cream relieves and hydrates dry skin; its blend of Shea Butter and Argan Oil restore elasticity and comfort, whilst Red Algae targets facial contours and 'double chin' area for younger, firmer-looking skin. A regenerating plant extract promotes collagen renewal and protection to ensure skin feels denser and looks younger. Expect a supple, redefined complexion with replenished moisture. Apply morning and/or night to the face, neck and décolleté after cleansing and removing all traces of makeup. Aqua (Water), Behenyl Alcohol, Glycerin, Dicaprylyl Ether, Aluminum Starch Octenylsuccinate, Butyrospermum Parkii (Shea) Butter, Cetyl Alcohol, Cetyl Palmitate, Cetyl Ricinoleate, Cyclopentasiloxane, Caprylyl Methicone, Glyceryl Stearate, PEG-100 Stearate, C10-18 ~Triglycerides, Caprylic/Capric Triglyceride, Ethylhexyl Palmitate, Jojoba Esters, Parfum (Fragrance), ~Helianthus Annuus (Suflower) Seed Cera (Wax), Polyglyceryl-3 Diisostearate, Butylene Glycol, ~Argania Spinosa (Argan) Kernel Oil, C30-45 Alkyl Cetearyl Dimethicone Crosspolymer, Sucrose ~Palmitate, Caprylyl Glycol, Pentylene Glycol, Chlorphenesin, Cichorium Intybus (Chicory) Root Extract, ~Davilla Rugosa Leaf Extract, Sodium Chloride, Glyceryl Linoleate, Acacia Decurrens Flower Cera (Wax), ~Polyglycerin-3, Prunus Amygdalus Dulcis (Sweet Almond) Oil, Trihydroxystearin, Phenoxyethanol, ~Xanthan Gum, Sodium Hyaluronate, Hydrolyzed Rhodophycea Extract, Lecithin, Rosmarinus Officinalis ~(Rosemary) Leaf Extract, Sodium Hydroxide, Glucose, Ethylhexylglycerin, Citric Acid, Potassium ~Chloride, Potassium Sorbate, Calcium Chloride, Tocopherol, Magnesium Sulfate, Glutamine, Sodium ~Phosphate, Ascorbic Acid, Sodium Acetate, Lysine HCL, Arginine, Alanine, Histidine, Valine, Leucine, ~Threonine, Isoleucine, Tryptophan, Phenylalanine, Tyrosine, Glycine, Polysorbate 80, Amorphophallus Konjac Root Powder, Serine, Deoxyadenosine, Cystine, Cyanocobalamin, Deoxycytidine, Deoxyguanosine, Deoxythymidine, Glutathione, Asparagine, Aspartic Acid, Ornithine, Glutamic Acid, Nicotinamide Adenine Dinucleotide, Proline, Aminobutyric Acid, Methionine, Taurine,Hydroxyproline,Glucosamine, Coenzyme A, Glucuronolactone, Sodium Glucuronate, Thiamine Diphosphate, Disodium Flavine Adenine Dinucleotide, Sodium Uridine Triphosphate, Retinyl Acetate, Inositol, Methyl Deoxycytidine, Niacin, Niacinamide, Pyridoxal 5-Phosphate, Pyridoxine HCL, Biotin, Calcium Pantothenate, Folic Acid, Riboflavin, Tocopheryl Phosphate.